What is the SUBSTITUTE Function? 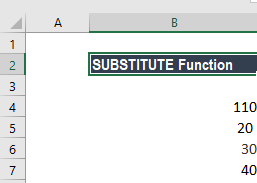 The SUBSTITUTE Function was introduced in MS Excel 2007 and is available under Text functionsFunctionsList of the most important Excel functions for financial analysts. This cheat sheet covers 100s of functions that are critical to know as an Excel analyst. It will replace one or more text strings with another text string. The function is useful when we wish to substitute old text in a string with a new string. In financial analysisAnalysis of Financial StatementsHow to perform Analysis of Financial Statements. This guide will teach you to perform financial statement analysis of the income statement, balance sheet, and cash flow statement including margins, ratios, growth, liquiditiy, leverage, rates of return and profitability. See examples and step-by-step instruction, we often import data from external sources such as PDFs. The function helps to substitute text strings from imported data. For example, if the data imported is 967-098-908, we can use this function to transform it into 967098908. The SUBSTITUTE function is quite similar to the REPLACE function. However, SUBSTITUTE replaces one or more instances of a given text string whereas REPLACE replaces text in a specified position of a supplied string. Text (required argument) – It is the text or reference to a cell that contains text for which we want to substitute characters. Old_text (required argument) – It is the text we wish to replace. New_text (required argument) – It is the text we want to replace the old_text with. Instance_num (optional argument) – It will specify which occurrence of old_text you want to replace with new_text. If you specify instance_num, only that instance of old_text is replaced. Otherwise, every occurrence of old_text in text is changed to new_text. We used the formulas below to replace text in the example above. Also, SUBSTITUTE is case-sensitive and does not support wildcards. 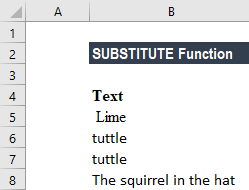 In the example above, if for Lime we provide old text as “l” then no replacement will be done by the function. The first step was to construct an address that would contain the column number. We did it using the ADDRESS function by providing 1 for row number, a column number from A1, and 4 for the abs_num argument (to get a relative reference): ADDRESS(1,B5,4). With the information, ADDRESS returns the text “A1.” We then used SUBSTITUTE to strip remove the number 1 like this: =SUBSTITUTE(“A1″,”1″,””).